Weddings Costs > How Much Do Wedding Invitations Cost? One of the essentials of planning a wedding is sending out the invitations. It is also important to send out reply cards in order to get a count of how many people will be attending. Wedding invitations can be a large expense or can be quite cheap, depending on your creativity and budget. How much are typical wedding invitation prices? The cheapest wedding invitations available are do-it-yourself kits. These can be found for $1-$2 per invitation through services such as WeddingBellInvitations.com. At an average of 100 invitations, this will cost between $100-$200. However, this will also take a lot of time – to those who believe that “time is money” – this may not be the best option. More complex and fancier do-it-yourself wedding invitations, which are also harder to make, will be between $3-$4 per invitation. This same price range applies to the cheaper end of the invitations you can order through a print shop or website such as WeddingPaperDivas.com. At an average of 100 invitations, this translates to a total cost of $300-$400. The most expensive invitations, which may include fancier decorations and specialty papers, can cost up to $6 per invitation and can be found through services such as InvitationConsultants.com. This results in a total cost of around $600. As noted on the chart above, the type of invite can bring the price up a lot. The simpler you are with your design, the less you will have to pay. Basic stock designs that are found at the store will cost a lot less than a design that has to be customized by a professional. The more you need, the more you’re going to have to pay. Keep in mind that bulk purchases can bring the per-invite price down. The print quality, just like the type will bring up the price. For example, a high-quality engraved printer can offer a higher quality print job. Also, adding accessories to your cards, such as a bow or jewel, can bring the fees up. Sending save the date cards and direction cards can increase the invite price by more than $1. Find a local craft or stationery store that can print the invites on the spot. This is a great way to make sure that the final print is to your liking. Many independent printers will be more than happy to work with your needs. This is a great way to customize your prints in person. While online services can offer a lower price, it doesn’t mean it will be a great deal. If shopping online, just make sure that you know about the reputation and quality of the invites. If ordering online, you will want to allow a lot of time for the order to arrive. If any revisions are needed, this will give you the opportunity to fix them. If you want something unique and special, you may want to consider a graphic designer. Once the design is done, you can ship it off to the printer to get the final product. While each company may differ, a set of wedding invitations usually includes the actual invitation with any specified decorations, a coordinated envelope (some contain an outer and inner envelope, others do not), an RSVP card, and an RSVP return envelope. The personalization of your printed wedding invitation will be included – you will usually have the choice of font and color of ink. Most online sites include free shipping on orders over a certain amount. 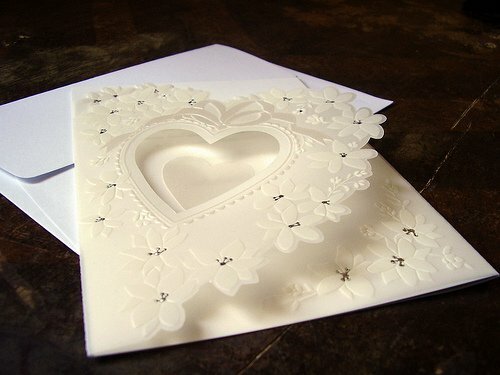 There are some services that allow you to completely design your own wedding invitation. This can cost up to $10 per invitation, or it may have a one-time design fee, usually around $50, in addition to the price of the invitations. In order to send out the wedding invitations, you must also put stamps on them. A stamp currently costs $.44, which translates to a cost of $44 per 100 invitations. However, you must also apply a stamp to the RSVP return envelope, so each invitation will cost two stamps – this results in a total cost of about $88. Some people also choose to send out “save the date” cards. Since wedding invitations are usually sent out only 6-8 weeks in advance, these save the date cards allow the recipients more time to plan. These are usually sent out a few months in advance. Save the date cards usually cost $.50-$1 each, and will also need a stamp. Keep your eyes peeled on the extras. The extras, such as bows and extra layers of paper, can really add up. If you want to save money on your invites, it’s best to keep it simple. Consider a package deal that includes everything in it such as the envelope, the invites and response cards. This is a great way to get a package deal for a reasonable price. Before the invites are ordered, get a second set of eyes to re-read the invites. Make sure that there are no spelling errors. Watch the weight of the invites. If the invitations weigh too much, additional postage rates can apply. It doesn’t hurt to throw in a few additional invites. That way, if some get lost or ruined, you will have a few to use as an extra. Do it yourself invitations are definitely the cheapest option. It is possible to find some really great deals on printed invitations by shopping around online, especially if you are buying more than the average number of invitations. However, if you don’t know what you’re doing, the costs could add up, according to womangettingmarried.com. Some people choose to save on wedding invitation cost by having people RSVP to an email address or phone number rather than sending a reply. This saves on the cost of the actual invitation as well as on the stamp. Consider going to shops such as Kinkos or Costco. These type of places may have templates for those who want to create the invitations on their own. There are also various catalogs and Internet sites that can offer a deal as well. If you want to design your invites online, VistaPrint.com is a great option to consider too. Browse Etsy sellers to see if you can find a lower cost alternative. Consider skipping the reception or direction cards to save $1 to $2 per card. Standard sized invitation cards will cost less than stock paper with an odd design. Sending out postcards for your “save the date” cards can save you money since postage will be cheaper.